Move over, Melissa Joan Hart. There’s a new teenage witch on the block, and this one isn’t playing around. Netflix’s Chilling Adventures of Sabrina is nothing like its ’90s TGIF sitcom predecessor, outside of some familiar names as well as the idea of a teen girl wrestling with high school drama along with learning to harness her witching powers. Instead of comedy, Chilling Adventures rests squarely in the horror genre. It’s filled with monsters, talk of the Dark Lord, curses, and even an appearance or two by Satan himself–whose design clearly took inspiration from Baphomet, the goat-headed demon that was first linked to the Knights Templar in the 1300s. Still, at the core is this dark and spooky tale is the story of a girl stuck between two worlds. 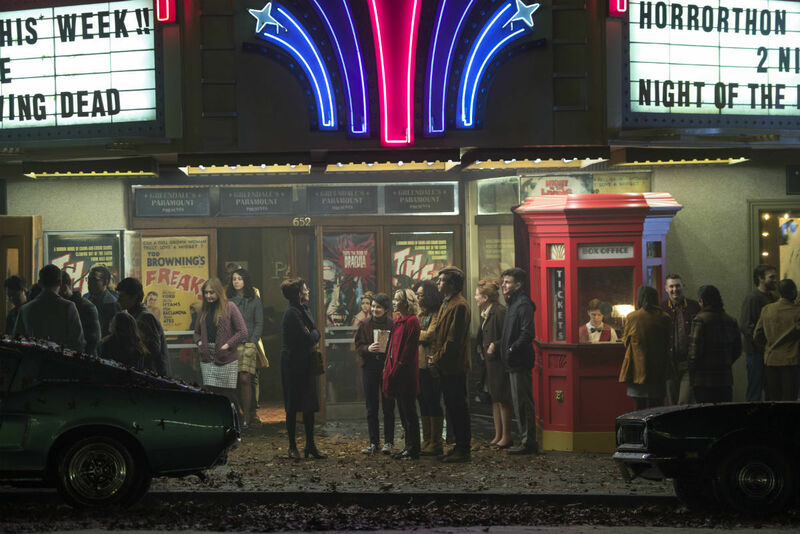 Sabrina Spellman, played wonderfully by Mad Men alum Kiernan Shipka, is on the cusp of her 16th birthday, a date on which she is being forced to choose whether to give up her mortal world–filled with classes, friends, and a lovable goof of a boyfriend–or forsake her family’s witch ancestry, losing her burgeoning powers. Her family expects her to simply hand her life over to the Academy of Unseen Arts and continue her witching studies, but that’s not necessarily the track Sabrina wants to take. After all, as horrifying as the scarier elements of this show can be, they’re all there to serve the story of empowering this young woman on her journey to adulthood. Outside forces are attempting to force Sabrina to choose a life she may not want. Instead, she’s attempting to forge her own road, which puts her family, friends, and even her own life–those monsters that come after her are not playing around–at risk. This is why Chilling Adventures is such a uniquely good show. It manages to tangle with modern day issues many face, while couching it all in a supernatural world. It’s exciting to watch Sabrina stand up to what is essentially a patriarchy, even though it is one led by a coven of powerful witches and warlocks able to summon demons to come after her. Let’s talk about those demons for a second. Like the new Halloween film, Chilling Adventures embraces the horror of old. Instead of over-the-top CGI monsters and lots of digital effects, this show relies on practical effects as much as possible. That means when the Dark Lord finally shows himself, get ready for a massive goat demon, complete with hooves. There is some CGI and digital effects at play, but so much of what unfolds on the show feels like it was all created practically. Channeling 1970s horror fits perfectly within the timeless world of this show. As with other series like Bates Motel and Gotham–not to mention Riverdale, which is by the same producers–it’s hard to pin down the exact year Chilling Adventures of Sabrina takes place. You’ll be hard-pressed to find a cell phone or mention of social media–or even a computer–in the series, while Sabrina and her friends go see old horror movies at the theater and dance to “Monster Mash” to celebrate Halloween. The series hails from executive producer Roberto Aguirre-Sacasa, who also serves as showrunner on The CW’s Riverdale and writer of the Chilling Adventures of Sabrina comic the show is based on, as well as Afterlife with Archie. Given how spooky that comic and his Afterlife with Archie books are, it’s no wonder he’s leaning so heavily into the dark and twisted for Sabrina. “I’ve always loved horror so I love to be able to explore that level with Sabrina,” Aguirre-Sacasa told GameSpot. Regardless of how good a concept or genre is, though, a show is only as good as its cast. Aguirre-Sacasa lucked out with Riverdale, finding an army of young and veteran actors that believably populate that small and bizarre town. With Chilling Adventures, his casting team has done it again, though in a very different way. While Shipka confidently anchors the series, taking viewers on a rollercoaster trip through the two worlds she’s trying to navigate, it’s those surrounding her that make the show so special. 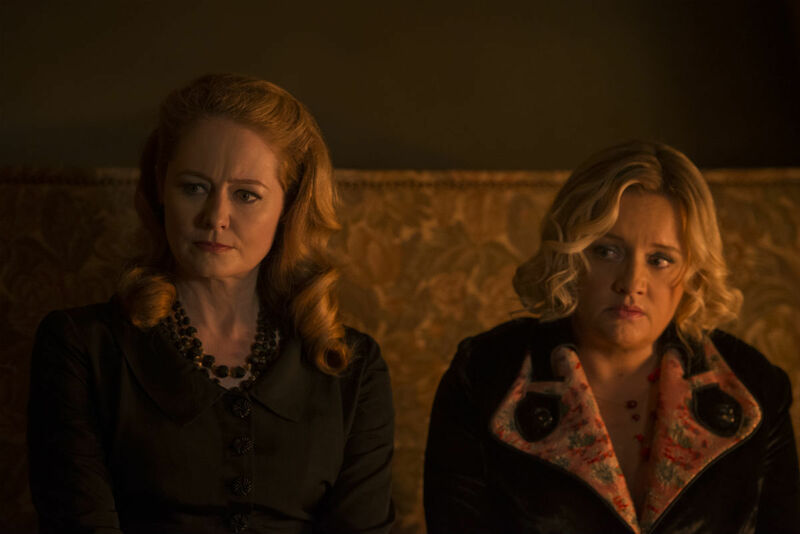 Her aunts Zelda (Miranda Otto) and Hilda (Lucy Davis) each have their own ideas of what Sabrina should do with her life. Having two powerhouse actresses in those roles alongside Shipka goes a long way in establishing the amount of female power surging through this show. Meanwhile, Sabrina’s pansexual cousin Ambrose (Chance Perdomo) struggles with being trapped in the Spellman Mortuary under magical house arrest, while doing what he can to help guide his cousin to find what she wants from life. Outside of Sabrina’s home, things get more interesting. Her mortal friends, including perhaps the most admirably oblivious boyfriend of all time in Harvey (Ross Lynch), show why the young witch is reluctant to leave the world she knows behind. 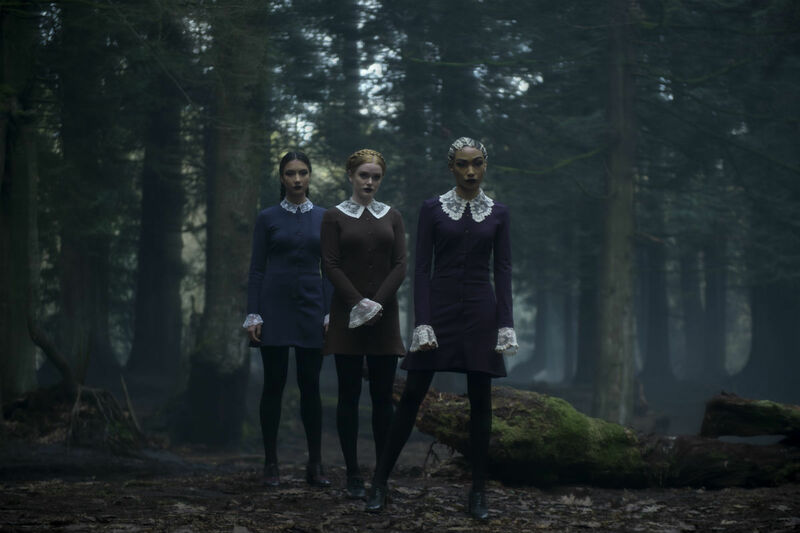 However, Academy of Unseen Arts students like the trio known as the Weird Sisters (Tati Gabrielle, Adeline Rudolph, and Abigail Cowen) manage to convey how scary but enchanting this new world could be. Those three characters, especially, are so much fun to watch float in and out of Sabrina’s life and always leave audiences wondering if they actually hate her or not. Rounding out the cast are actors like Michelle Gomez as the delightfully devious Madam Satan and Richard Coyle as Father Blackwood, the high priest of the Church of Night, who does not hold Sabrina in very high regard. It’s hard to find something to dislike about Chilling Adventures of Sabrina. There’s a moment or two that might seem like the show is trying too hard to channel the teen angst and melodrama of Riverdale, but given they come from the same creative force, that’s not surprising. And if you’re going into it expecting incredibly cinematic visuals, you might be disappointed, as the inspiration for the show’s looks is clearly older horror films. 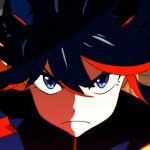 The only real complaint might be with the pacing–there’s a filler episode early in the first season that seemingly grinds the overarching plot to a halt. It’s eventually connected to the larger storyline, but the timing feels off. 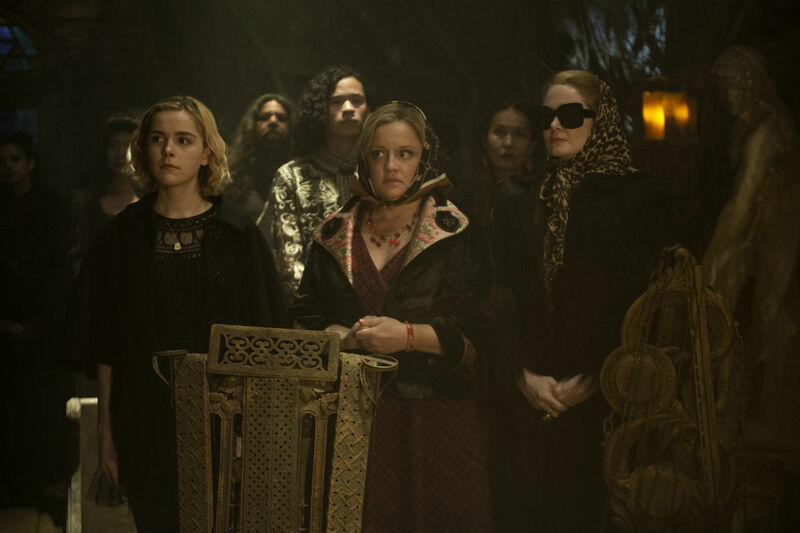 The first several episodes of the show quickly shoot forward as Sabrina comes to grips with balancing her mortal life and the witching world, and it’s strange to wedge in a standalone story so early in Season 1. However, it’s hard to think of a better Halloween binge than Chilling Adventures of Sabrina. With a new Halloween in theaters, and this and Haunting of Hill House streaming on Netflix, there are more than enough scares to power you through the end of October. Chilling Adventures of Sabrina‘s first season releases Friday, October 26, on Netflix.